So like I told you in my heavy and ultra-serious post of yesterday, I realized I am, in fact, going to die someday. In light of that realization, I thought I would write out some rules for whomever will be tasked with planning my arrangements. Blog posts are legally binding, right? As mentioned yesterday, you may under no circumstances play On Eagle's Wings, Be Not Afraid, I am the Bread of Life, Amazing Grace, or for the love of God, All I Ask of You. If upon reading any of these titles you are thinking to yourself, "Oh, I love that song! What is wrong with that song? It is so touching." then you are not the proper person for choosing my funeral music. You can be in charge of sandwiches. My most pressing requirement in choosing a funeral parlor is that the mortician (Is that p.c.? I feel like that may be an offensive word or something.) be skilled in knowing how to properly present a female face. No hideous shades of lipstick, no caked on foundation and - this is important - the mortician must be aware of the critical importance of facial hair removal. I learned once that your hair continues to grow after you die for some time. That little factoid has sufficiently scared me out of ever dying and I have been on the perpetual quest to find a friend I can trust with the task of postmortem plucking. * Upon reading this, you are now hereby legally required that if attending my wake you immediately and inconspicuously pluck out any unsightly hairs you may notice with the tweezers you will have at the ready in your pocket. ** I trust you can disguise this compassionate work of mercy with some clever prayer form as you kneel in front of my perfectly made up face. **Bring a razor, too, just in case. Also, find someone who will make my hair look fabulous. For once in my life (ha!) I'd like to have great hair. No eulogy at the Mass. Just no. This has less to do with my profound humility as it does that it's not really a part of the funeral liturgy and this is the one time other than my wedding Mass that I get to insist on the rubrics. I'm dead, you're not allowed to be mad at me or roll your eyes. I do fully expect and invite many odes of praise and adulation, tears and anecdote sharing during the wake and at the luncheon afterwards. There must be great food at the luncheon (or dinner, whatever you decide) afterwards. Or maybe just pizza. There should definitely be chicken wings. Put something cool on my prayer cards and pick great readings. If you spend ghastly amounts on flowers, you obviously did not know me and my cheapskate tendencies well. I will haunt you and instead of leaving dimes or pennies (that's a thing I've heard of) I will take them away. You'll be all, "Where did that money go?" and I'll be all "Hahaha! I'm bringing it to people who know how to use their money well!" (This is getting ridiculous.) Pick a few daisies if you must and give the money to something good. It's a basket casket! 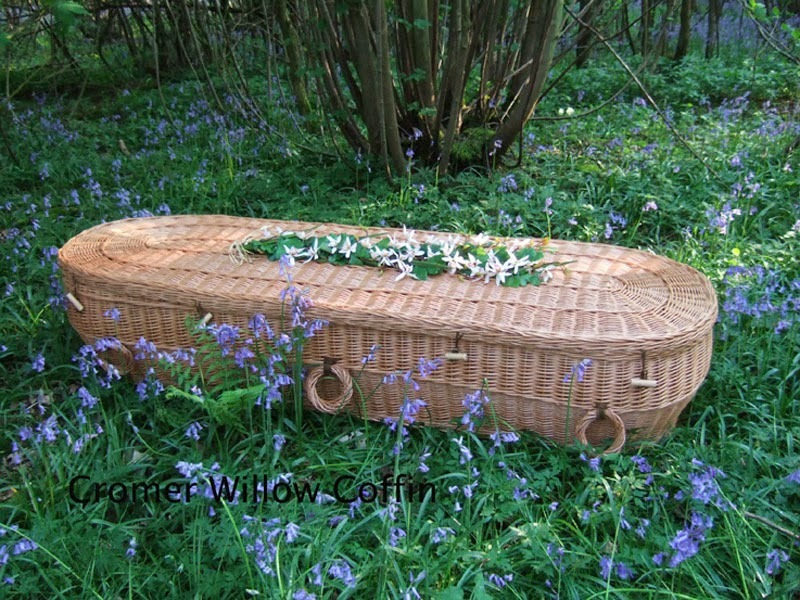 A basket casket. That is totally me. Which I'm guessing is probably illegal. Have I sufficiently freaked you out yet? Fear not. Because while we Catholics take death seriously we also at the same time get to laugh in its face. Another one of those fun Christian dichotomies. Yay! We'll be heading out camping this weekend so this information may come in handy quite soon because bears. Now get on over to Jen's where you are guaranteed takes of the way less morbid variety. And don't worry, I shall be switching topics soon so as not to worry my husband any further. This is awesome. I actually wannt to be your friend more now. I loved these last two posts, Mary. You're right -- we do (or should) take death very seriously. Why else do good works and avoid sin if it's all over when it's over? Sheesh! 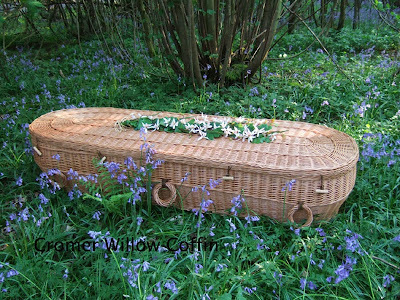 I have started planning my funeral -- isn't that over-the-top morbid? I am such a control freak (gasp!) that I don't want anyone choosing my psalms or reading or Gospel, or Lord forbid, my songs! I already have a list of songs acceptable to me and you better believe Eagle's Wings, Be Not Afraid, or Taste and See are NOT on it. I have a rule about songs -- must be written before 1960. Preferably 1860. I do love It is Well With My Soul, even though it's not a Catholic hymn. Maybe a generous donation to the church can get that one snuck in somewhere. I am in disagreement about the flowers however. I am a total cheapskate, but I'd like to go out with beautiful flowers. And my husband better keep flowers at my grave or I'll haunt him! And no open casket for me! Long comment -- but long story short, I get you! As one who helped ease three parents into death (two in-laws, one actual parent), NO! This is not over-the-top morbid! It is a great time-saver and comfort-giver to the survivors. It is soooooo much easier than having nothing in print. Years before my dad died, he wrote many long pages about his funeral. He wasn't even sick, so we all made fun of him. However, when he actually died, we pulled out that loooong document and did what he said he wanted. What a relief! That contrasts greatly with the deaths of my in-laws. PS I know this is a really morbid confession, but I keep funeral clothes, in current sizes, in the kids' closet, because I know if I die my husband will let them wear jeans, or whatever, to my Mass! Okay, THIS, however, is really hysterical!!! I love it! This is great! My grandmother left strict instructions that everyone wear red to her funeral. The priest pulled back his vestments to show his read sweater. So great. Love the chicken wings. where did you find the pine box? I want one! Seriously - can you pre-order? 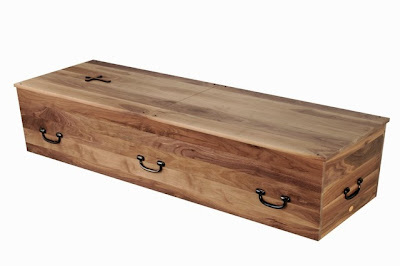 I don't know where Mary found her casket image, but there is an order of Trappist Monks who make them ( http://www.trappistcaskets.com/ )-- my husband has already requested his. I did not know some states prohibited them (as Melody, below, stated) but I assumed a Catholic funeral director could get one. Yep, I linked the Trappists up there. I love that that is their ministry and really, those boxes are so much more beautiful to me than a fiberglass metallicy looking one! I think a moratorium on all things Haugen and Haas is probably necessary ;) You really don't want the processional to be "All Are Welcome" though? How about liturgical dance? Cool? OOH and vestments that look like a patchwork quilt of children's faces!!! OMYGOSH, I FORGOT TO ADD ALL ARE WELCOME!! I hope my planners read these comments!!! Glad I'm in good company :) You're probably right about the hair. My family and friends probably wouldn't recognize me without my signature scrappy ponytail! Oh, and instead of "processional" and "recessional" be sure to have somebody announce them as "hymn of gathering" and "hymn of sending forth." My personal unfavorite is Lord, When You Came. http://www.youtube.com/watch?v=nff3jGFKorY It always reminds me of an old western. The hero is entering a southwestern town at noon. His horse is ambling, as emphasized by wood blocks being struck on beats 1, 3, 4, and 6 of a 6/8 measure. If I have the notation correct, these should be on these notes: C (tonic), G, E', G. There is a Mexican taking a siesta in the shade with a very large sombrero over his face. The proper harmony to this piece requires a lot of vocal scooping. My kids were always annoyed at me when I gave in to my urges and scooped the harmony while sitting with them at Mass. They just couldn't take their mama anywhere! Lol! I don't think I've ever heard that one!! Once in a while I try to sing harmony with the music ministry and I probably sound like the biggest wannabe. They're probably all, "lady, what are you even trying to do??" Mary, There is a problem with the menu. You make the best chicken wings and they don't freeze well so we would have to settle for second best chicken wings. This is the best, most hilarious and most honest post ever! This is just awesome. Apparently I have very cheesy taste in music (you're not the first to tell me so) so I will relegate myself to sandwich- and/or beautician-duty. Those caskets are awesome. I will take either of those in the event that a Boromir funeral is in fact illegal. Enjoyed reading your plans. Of course, if you want to make God laugh... So yes, the music ministry lady is not going to get the sheet with your list and all of your banned songs will be played, and all of your friends and family will try to disguise their snickers as distress. Oops, there goes my sick Irish humor. Love everything about this post and the comments in a non-weirdo type way . I totally want to copycat this idea. Oh. my. word. A funeral link up?! Would that be taking it a step too far?? Because I'm totally down with that.